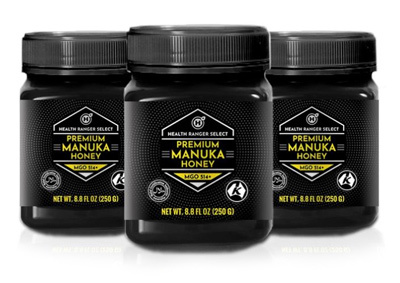 After more than a year of sourcing and lab testing, we’re now introducing the most potent and heavily scrutinized raw Manuka honey product in the world: Health Ranger Select Premium Raw Manuka Honey. This is the only Manuka honey product in the world that’s laboratory tested for MGO (Methylglyoxal) by the University of the Sunshine Coast in Queensland, Australia (via Dr. Peter Brooks) and laboratory tested for glyphosate and heavy metals at CWC Labs by Mike Adams (see video below) using a triple quad mass spec instrument. In addition, we test every production lot for pesticides and microbiology, too. This premium, raw Manuka honey product rates UMF 15+, delivering at least 512 ppm of MGO and demonstrating at least 15.0 NPA “non-peroxide activity,” a description of its medicinal capabilities. “UMF” is a trademark owned by Dr. Peter Molan at the University of Waikato in New Zealand, the discoverer of NPA effects of Manuka honey. In effect, this means our Manuka honey has guaranteed potency that’s verified by laboratory analysis. With the Manuka honey market currently plagued by counterfeit products and watered-down corn syrup adulterations, getting full-strength, lab-verified, high-potency Manuka honey is a difficult task. Many sources cannot be trusted. Almost no one conducts the laboratory testing that’s needed to guarantee potency, purity and safety. But we’ve done all the lab testing and sourcing. We’ve got the world’s most scientifically scrutinized Manuka honey now at the Health Ranger Store, in limited quantities. Click here to learn more about our premium raw Manuka Honey. Although we cannot make specific medicinal claims about our Manuka honey product, the FDA has granted approval to specific brands of Manuka honey for use in first aid wound bandaging due to its natural antibiotic effect. See Manuka honey may be the future of antibacterial superbug medicine for details on the scientific studies of Manuka honey treating superbug infections. Manuka honey is derived from the Manuka bush (Leptospermum scoparium), giving it a very unique combination of phytonutrients that have extraordinary properties for supporting wound healing. Thus, Manuka honey can be stored by preppers and used as both a delicious and nutritious food item as well as a first aid remedy. It isn’t, of course, a substitute for professional emergency medical care, and it’s not a cure-all for serious wounds, but as a topical remedy, its effects are extraordinary and well documented. Search GoodGopher.com for “Manuka honey superbugs” and see what you find. You will be amazed. Beyond its use as a natural first aid remedy, Manuka honey is also an incredibly valuable barter item with an extremely long shelf life. Archeologists have found fully-intact stores of honey in ancient Egyptian tombs. Genuine honey can literally be stored for not just decades but centuries under the right conditions (cool, dry, away from sunlight). The FDA, of course, won’t let us claim the real shelf life potential for Manuka honey, so we label it for two years of shelf life. Because of its multitude of uses, Manuka honey holds value as a barter item that everyone values. Who couldn’t benefit from Manuka honey in an economic collapse? Who doesn’t want a delicious sweetener for their beverages and desserts? That’s why, alongside your other preparedness gear like iodine, ammunition, colloidal silver, firearms and flashlights, you’ll be smart to have some Manuka honey on hand. It’s portable, valuable and practical. Get your own supply of raw, lab-tested Health Ranger Manuka Honey at this link.